Recently I decided to be more proactive in helping my family to eat more healthily with a complete overhaul of the way we usually eat breakfast, lunch, and dinner. It’s easy to find yourself in a never-ending cycle of relying on the very wide selection of online food delivery platforms at your disposal to feed you and your family, without having to lift a finger – but for scrolling, selecting and paying online for your take out! We used to make excuses about our weekly take out orders with spiels about how much cheaper it is to order in rather than cooking from scratch, and secretly I knew this was a fallacy. You can shop locally for fresh and sometimes organic ingredients to whip up quick, tasty, healthy, and even zero waste meals for the whole family for under RMB 100, particularly when using ingredients you already have stocked up in your pantry and buying vegetables you can cook in different ways throughout the week with only the need to stock up on your choice of meat or vegetable options. My spicy Scotch Patch Chicken and Quinoa salad was a breeze to make and was prepared, cooked, and eaten within an hour! If you’ve never ‘scotch patched’ a chicken, fear not! It’s easy and helps a whole chicken to cook evenly in the oven. 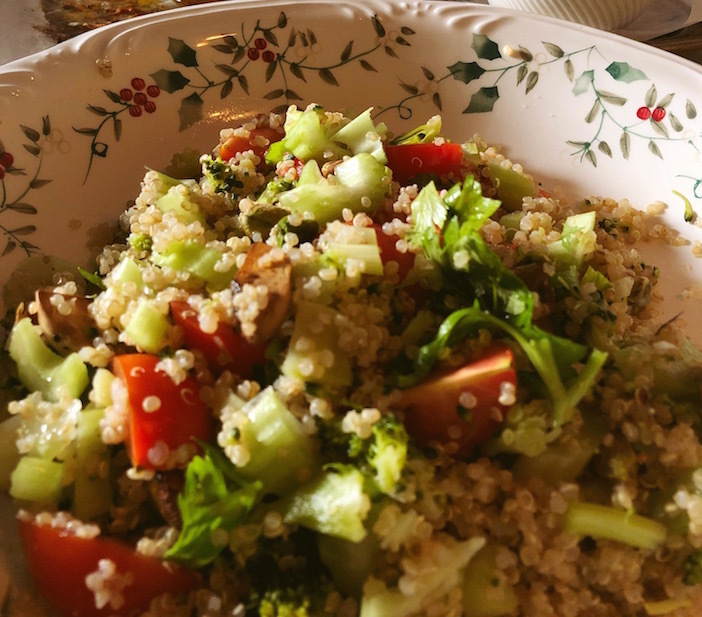 Quinoa cooks similarly to rice and is a less starchy staple, full of vitamins, high in protein, and awesomely versatile. To start, wash your chicken thoroughly under cold running water, squeeze a little lemon over the chicken and inside the cavity and rinse. Place the chicken on a dry surface and pat down with a clean kitchen towel or tissue paper. Using kitchen scissors, cut along the right side of the spine to cut through the whole chicken to the other end. Do the same on the other side and remove and discard the spine. Turn the chicken over, cavity facing downwards and flatten with the palm of your hand. You may need to push down on the thighs until you have an evenly scotch patched chicken. Cut a few slits in the chicken and place on greaseproof paper on top of an oven tray. Take all the marinade ingredients and blend together. Take a marinade brush (or use your hands) and cover the Chicken on all sides. Cover and leave for a few minutes (if preparing in advance, marinade overnight in the fridge), then pop into a preheated oven at 180C. Cook until the skin is crispy and the meat is cooked through (30 – 40mins). For extra crispy skin, turn up the temperature to 200C for the last 6-10 minutes. While your chicken is cooking in the oven, add two cups of water to a pan and one cup of washed quinoa. Bring to the boil and then simmer for 6-10 minutes. Fork through and place in a bowl over ice to cool. Dice the mushrooms and dry fry until brown, add a little olive or coconut oil and add little florets of broccoli into the pan. Stir fry until cooked and leave to the side. Chop up the cherry tomatoes, celery, red onion, and coriander and add to the cooled quinoa. Stir in the broccoli and mushrooms. Drizzle over the olive oil and a squeeze of lemon. Season with sea salt and combine. Finally, add a few pistachios and set aside. 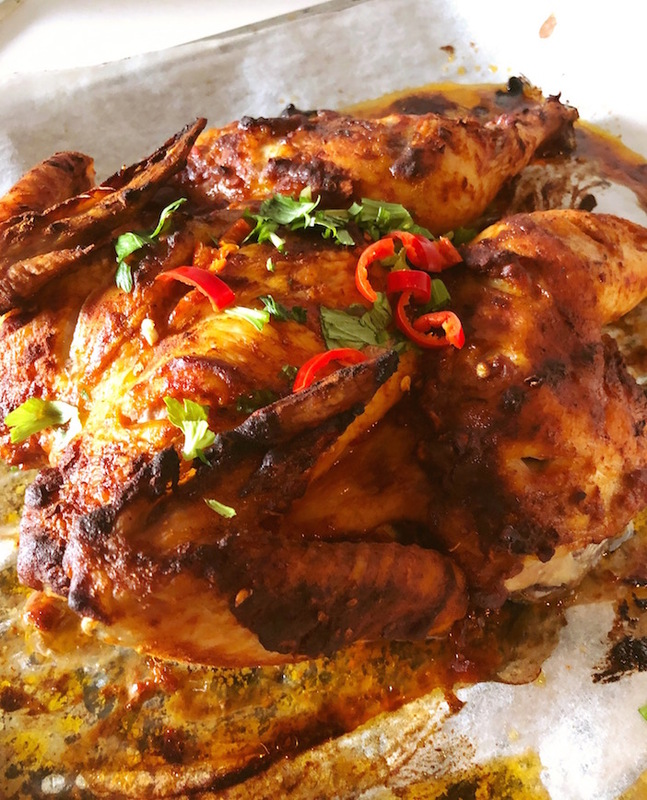 When the chicken is fully cooked, place onto a wooden chopping board and garnish with red chili and coriander. Place the quinoa in a bowl and serve on the board. The chicken should be melt-in-mouth and easily removed from the bone. Enjoy and don’t forget to share photos of your own scotch patch chicken when trying out this recipe.